Like many people, Senior Wealth Planner Darcy K. Houghton became a member of the sandwich generation before she ever heard the formal term. In short, you join this unofficial club when you find yourself both raising kids and caring for at least one aging parent. Houghton’s story may sound familiar: Life had flung her childhood family to different parts of the country. She landed in Reno, Nevada, working in the California and Nevada region of Wells Fargo Private Bank. There, she and her husband were busy raising two sons (now ages 16 and 18). Her brother lives in California, as does their mom. Their dad, Olin, had retired from his work as an accountant and building contractor and was living in Colorado. Then, two years ago, Olin suffered a medical event and landed in the hospital. After recovering, Houghton brought him to her house to stay in their in-law suite, where she could keep an eye on his diet and health. Houghton thought the arrangement would be temporary, but Olin ended up staying. In retrospect, she says, “There were a lot of things I would have done differently.” The following advice comes from what she’s learned from the experience. From the moment you have kids, life is in constant flux. “Adding a parent to the household is just like adding another child. It’s another person who doesn’t pedal in the same direction as everyone else,” Houghton says. “But the amazing thing about a family is that we adjust when someone else joins it.” Keep the lines of communication open, and address concerns as soon as they come up so resentment won’t build. How often will everyone spend time together? How can the parent help with your family’s chores? What does transportation look like? What are the available finances? Houghton says it’s ideal to have these conversations before (or as soon as) your parent moves in, so everyone is on the same page. As a Wells Fargo wealth planner and as a former estate planning attorney, Houghton has experienced sibling challenges. She suggests talking with your siblings and parents about how to pay for the parents’ daily living and care. She believes that having a parent pay a fair amount of money to cover rent and any caregiving services can help ease the financial burden and any resentments that could arise. Getting buy-in from the siblings creates transparency and trust. Providing for senior care involves a complex web of services that need to be aligned. 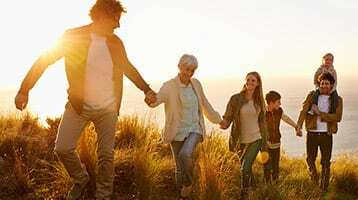 Consult with your financial advisor or wealth advisor for help in assessing what resources are available to your parent and how to make them last. Your advisors can also work with you and your attorney to determine what provisions you may want to include map out in an estate plan, which should include a medical and financial power of attorney. In addition, they can point you in the right direction for financial assistance and support for your parent. Depending on how much is invested with Wells Fargo Bank, you may also be eligible for help from professionals at Wells Fargo Life Management Services, which can take over tasks like bill paying and double-checking health care statements. Houghton says that, in the midst of our hectic lives, it’s important to schedule some fun time with your loved ones—on both sides of the sandwich. “Dad can’t play volleyball anymore, but maybe he and my younger son can hit a bucket of balls at the driving range this summer,” she says. Making new memories can strengthen bonds, which can make everyone happier in the long run. Find six more strategies to help alleviate the pressure of being in the sandwich generation. Laura Quaglio is a writer and editor based in eastern Pennsylvania. Any estate plan should be reviewed by an attorney who specializes in estate planning and is licensed to practice estate law in your state.